Wonderboy 3: the Dragon´s Trap starts just at the moment in which Wonderboy in Monsterland ended, with our hero defeating the Mekka dragon. But what´s this? Suddenly, a strange blue flame appears transforms our hero into a green lizard. Your mission now is to retrieve your human form while finally restoring peace to Monster Land. Despite being a somewhat early release, WBIII has some of the most polished gameplay of any of the 8-bits title of the era. You have an entire world to explore, but not all places are accessible from the begining. You´ll need some special abilities to do that, and here´s where WBIII main feature comes into play: Every time you defeat one of the bosses, you will gain the ability to transform into several animals, each one different from the last, granting you access to new zones of the game. For example, do you see that small gap you can´t get in? Come later when you have the power to transform into a small mouse to explore what´s behind. The rest of the game is you typical adventure-RPG stuff. 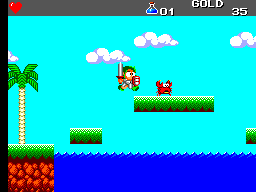 Collect gold by killing enemies, use it to buy armor, swords and such at the shops... But wait, what´s this? Why can´t I buy that piece of equipment? Because WBIII introduces yet again an original aspect (by the time): the charisma points. Why could such a dirty lizard buy the best armor in the game? Sorry, but you´ll have to wait until you´re transformed into an animal with more charisma. Also, take into account that some equipment gives or takes you charisma points. It´s not the same wearing a Bronze armor than the Legendary one. This adds quite a bit of depth to the already interesting gameplay. Charming, is the perfect word for describing them. They are very colorful, with the main character and the enemies looking very cartoony. If there´s something to complain about, its the bland backgrounds. 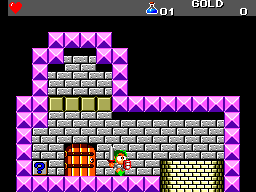 Sometimes, the enemies blend with them, which can be confusing for the player but nothing too frequent or aggravating. Oh my, we´ve hit one of the highest points of the game! This is one of those rare cases in which the entire soundtrack fits the game like a glove and every theme is just perfect. Just wait until you hear songs like the Dungeon theme or Side-Crawler´s Dance! You´ll be humming them in no time! Good, but not perfect. There´s not any complicated movements to do (the hardest one is Up+1 to use your special powers, go figure), but the control of the main character is a bit slippery for my tastes. Also, sometimes the enemies hit you and don´t let you move until you touch the ground (even though you don´t get any damage), which can be pretty annoying. By the way, you can see that the controls are pretty good if my main complaints are these ones. For a game of this genre, WBIII has plenty of replay value. The main quest is not very long (about 8-10 hours first time, and 3-5 for the next ones) but you can you try to finish every area with different animals,and there´s lots (and I mean LOTS) of secrets hidden in the game that you probably won´t find your first time playing. And you can save your game with a handy password function. 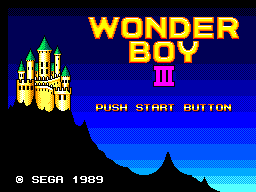 Wonderboy 3 is, in my oppinion, the peak of the Wonderboy series. It took the things that made Wonderboy in Monsterland great and added interesting gameplay features, while polishing the graphics and sound, making a damn near perfect package. Not only is one of the best games you can get in our beloved system, it´s one of the greatest games released in the 8-bit era and one everyone should play it at least once.